A large explosion hit central Aden on Sunday,an Al Arabiya News Channel correspondent reported, adding that there were several casualties. The correspondent said the blast targeted the city's governor and security chief. On Thursday, a suicide bomber blew up a vehicle packed with explosives when he was stopped at a checkpoint on the perimeter of the compound around Shayae's house, wounding a guard. In February, suspected Al-Qaeda militants opened fire on a convoy carrying Shayae and Aden governor Aidarus al-Zubaidi, but they escaped unharmed. Shayae and Zubaidi also survived a car bombing that targeted their convoy in Aden on January 5 killing two of their guards. 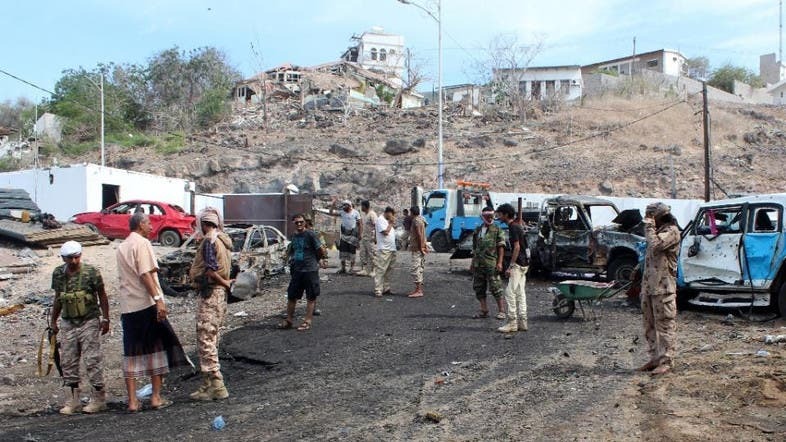 Other security officials in Aden, the temporary base of Yemen's Saudi-backed government, have been targeted by bombings and assassinations -- some of which Al-Qaeda or the Islamic State group have claimed. Unidentified gunmen on Friday killed Aden's traffic police chief Colonel Marwan Abdulalim as he was in his car going to weekly Muslim prayers. Militants have exploited the unrest in Yemen as loyalist forces, backed by a Saudi-led coalition, fought against Iran-backed militias since March 2015 in a war that has left more than 6,400 people dead. The blast targeted the city's governor and security chief.